Jack is almost 5 and quickly learning the ins and outs of the kitchen, but guys I am still a paranoid Mom. I am always nervous for him to be around the hot oven, the mixer and of course the kitchen is full of knives. When we got the opportunity to review Gramma in a Box I was really excited because I quickly learned that pretty much everything was done for us and all we had to do was have the fun. We got a great Springtime themed box which included some fun chocolate melts (just had to microwave those) to create some marshmallow flowers. Those were a little hard for Jack and he said that they didn’t “look perfect” but that they were tasty and I have to agree. We got to make bird nests with colorful rice cereal and delicious jelly beans for eggs and also got to decorate cookies. Jack had so much fun with the icing bags and actually did really well with those. We typically don’t use bags for icing when decorating cookies, but now I see how much fun he had with it and I want to incorporate this in our future baking advetures. So by now I know you are asking how do you get in on this? It is really simple. Order by May 3rd to get the next box and here is the best part– If you select the Auto Debit option you get your first month for just $1. Of course you can keep them coming, or cancel if you wish with no further charges. Another perk is that if you use the 3 or 6 month option and use code 19off you get $19 off. Subscribe to Gramma in a Box today! 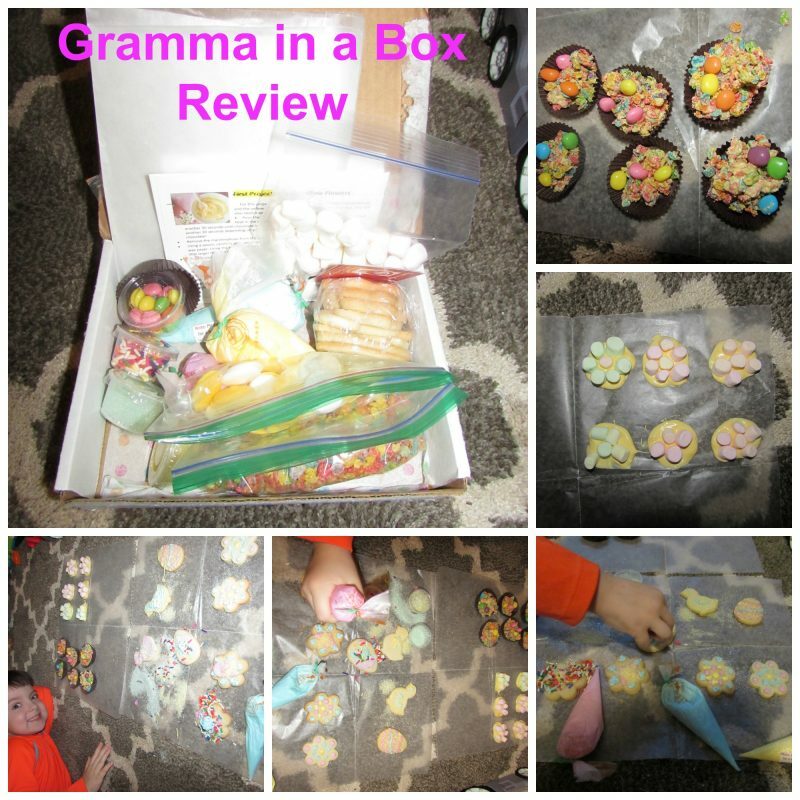 Making memories with our boys and adding my love of all things cooking made Gramma in a Box the perfect review for us. I will be totally honest in saying that we spread everything out on the wax paper on our living room rug and waited until our youngest went to bed and Jack and I had a blast. I am quickly learning with projects just like this that not everything has to be perfect or even done in the “right” place but making memories, taking pictures and having fun are just some of the bonus perks of being a mom! Thank you Gramma in a Box!